A dazzling bit of tekkers from India! Understandably, the Indian Super League is often neglected in the wider scope of the footballing world. But now it’s its time to shine with Chennaiyin FC’s Raphael Augusto dragging the attention bag to Central Asia. 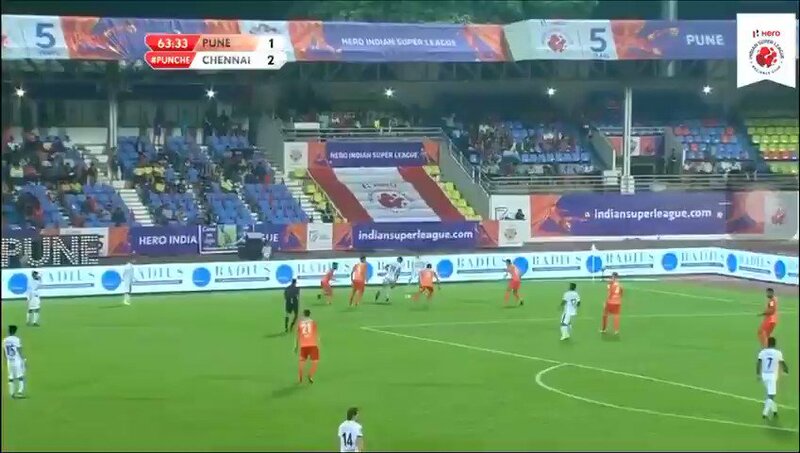 Chennai were leading rivals Pune 2-1, but the occasion must have got the better of midfielder Augusto just a little after the hour mark, when he decided to display some absolutely scintillating skill that wouldn’t look out of place in the upper echelons of the Premier League or La Liga. Finding his way crowded out onto the left wing, a little distance outside the Pune box, Augusto decided to leave one player not just with an absence of points, but also completely red-faced. Collecting the ball on his right-foot, Augusto offered no hesitation in flicking the ball up, contorting his foot to scoop the football down onto the ground and with the touch of the touch launch it over the defender’s head. The act ultimately left the defender schooled and dumbstruck as it flicked over his bonnet to allow the passage of play to continue with Augusto trying to play in a fellow forward. Though the ball eventually was removed from danger in that particular instance, it was a sublime moment that deserves to be replayed. In a game that saw four yellow cards a straight dismissal for Pune player Marcelinho, Chennai eventually saw out the match 4-2. The result saw Chennai record their first win of the season and leapfrog over their opponents in the Indian Super League table, and has left Pune bereft at rock-bottom. But thanks to Augusto’s moment of brilliance - after apparently YouTubing a host of Jay-Jay Okocha videos - the talking point of the match was really defined by something else. This skill from Raphael Augusto just deserved more. Much more.